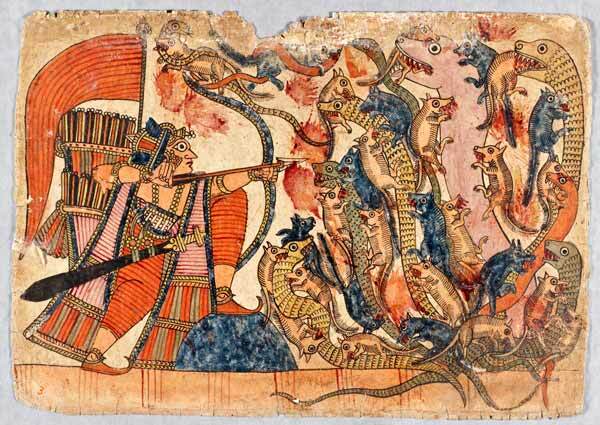 Ahiṁsā or nonviolence might seem an unlikely topic for one of the world's greatest war epics. 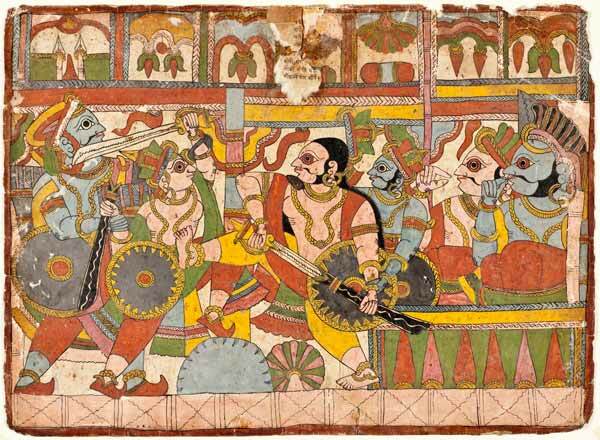 Any student of Indian philosophy or religion undoubtedly associates the Mahābhārata with Lord Krishna urging Arjuna to take up his weapons and fight and the bloodbath that follows. And despite the attempts of Gandhi and many others to make the struggle between the Pāṇḍava brothers and the sons of Dhṛtarāṣṭra metaphorical, no one can deny the reality of carnal savagery in the text, even on the part of the "good guys." 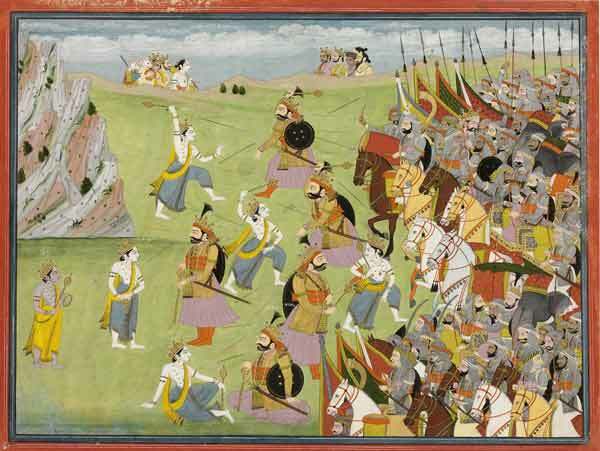 While on the one hand advocating strong action appropriate to one's station in life, the Mahābhārata also harbors myriad complementary views, acknowledging the significant contributions of numerous "minority" positions and practices. 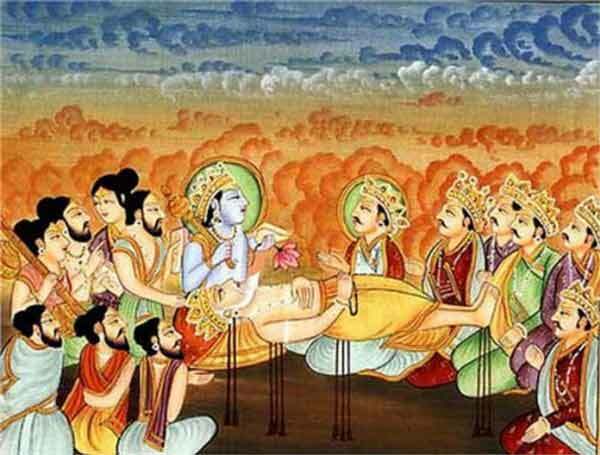 Bhīṣma, the paragon of knowledge and the grand-uncle of the text's protagonists, gives forth a wellspring of information about dharma on his deathbed of arrows. Within these discourses, several references are made to nonviolence or harmlessness (ahiṁsā) at underscore its emerging importance as the prevailing virtue to be observed by Brahmans and renouncers. 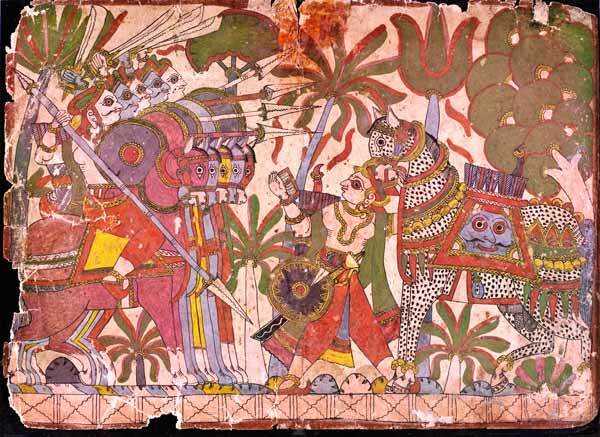 In the essay that follows, I will investigate three such instances within the Sānti Parvan and the Anuśāsana Parvan. The first takes the form of a story that I will summarize. It includes reference to the tension between showy asceticism and a more measured form of spirituality. It includes extensive descriptions of how animals are maltreated, and develops a rhetorical argument and appeal for observing nonviolent principles. The second example is a very gracefully crafted summation of monistic philosophy through which one is encourged, by dint of seeing other as self, to treat the other as if it were one's own self, and hence adopt nonviolent behavior. The third example advocates vegetarianism as the most obvious and appropriate modality for practicing nonviolence. In response to a question by Yudhiṣṭhira regarding the nature of righteousness and dharma, Bhīṣma tells the tale of an encounter between a Brahman ascetic named Jājali and a man named Tulādhara, a merchant (and perhaps a Jaina) Jājali had devoted years of his life to the most austere of penances: complicated fasts, protracted periods of silence, and such utter disregard for his body that he no longer bathed and his hair became matted. During one particularly stringent phase in the forest he abstained from all food and, while sustaining himself on air alone, he remained in a standing position, like a post, with no movement whatsoever. A pair of Kulinga birds nested in his locks. Months passed. 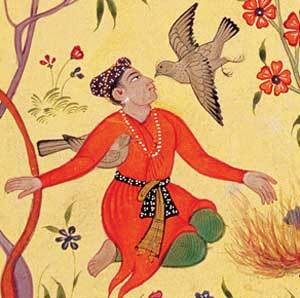 The birds mated, and from the eggs on Jājali's head, young birds hatched and were nutured by their parents. Even after the birds had learned to fly, Jājali stood stationary. But finally, after they had fully matured and abandoned their safe haven on his head, Jājali allowed himself to rejoice, and proclaimed that he had won great merit by his noble deed, and that no one was his equal. The gods, however, heard his boast, and a voice from the sky told him that his virtue and merit were surpassed by Tulādhara, a shopkeeper in the city of Banaras. Jājali then went in search of this wise man and found him at his haberdashery. Tulādhara greeted Jājali knowingly, and told him that he knew of his austerities and that he knew about the birds that had been born on his head. He also chided the Brahman for his pride, and asked how he might be of service to him. Jājali, in the style of the Upaniṣads, asked Tulādhara to tell him of correct morality and the ways of knowledge. 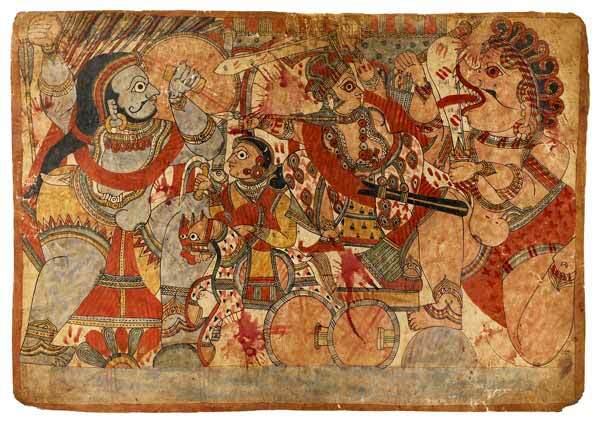 Jājali's response, in praise of nonviolence, covers a wide range of issues. He replies that "harmlessness towards all creatures" is the highest morality. Because of his commitment to this lifestyle, he says he never cheats anyone, never quarrels or hold grudges. Reminiscent of the Bhagavad Gītā, he proclaims "My scales are perfectly even, O Jājali, with respect to all creature…I cast equal eye upon all creatures…I see no difference between a clod of earth, a piece of stone, and a lump of gold" (Ganguli:IX, CCLXII, 234). He claims that by following this vow, he has no fear of creatures, nor do creatures fear him. He claims that speaking truth and by practicing the dharma of nonviolence, one enjoys even greater fruit than that gained by sacrifices or penances. He criticizes those that castrate bulls and pierce their noses and force them to serve as beasts of burden. He claims that "in every creature that is endued with the five senses live all the deities…The goat is Agni. The sheep is Varuna. 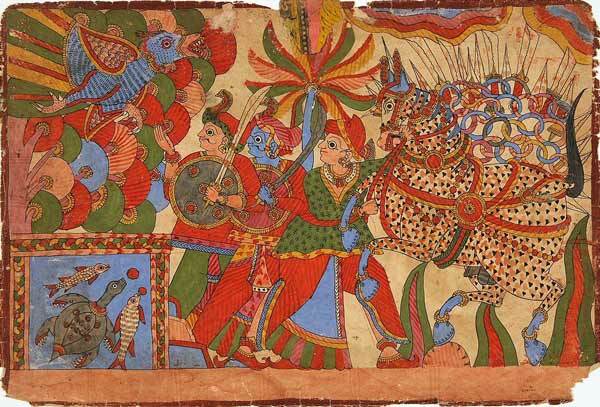 The horse is Surya. Earth is the deity Virat. The cow and the calf are Soma. The man who sells these can never obtain success" (Ganguli:IX, CCLXII, 236). He equates acts of injury done to animals to abortion, and notes that Nahuṣa, who had both killed a bull and caused a foetus to abort, thereby brought diseases to creatures and was barred from religious rites. He even condenms agriculture as harmful to creatures and the earth. Jājali protests that Tulādhara's teachings run counter to the natural order of things, and that they seem quite heretical. Without the support of food, he states, the world will come to an end. In response, Tulādhara states that nature provides abundantly. 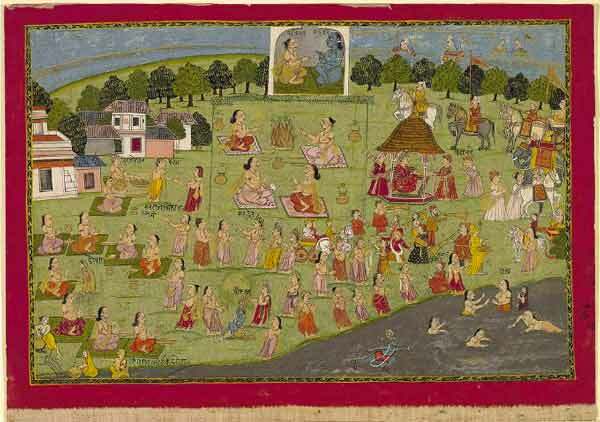 Appealing to a Golden Age of long ago, Tulādhara tells of days when crops sprouted forth from the earth without cultivation. He assails the greed that has overtaken people and forced the proliferation of needless and harmful rituals and sacrifices. He condemns covetous priests who assist at ceremonies for the "misguided" and have as their end material gain rather than liberation. He urges using rice balls to replace animals at Vedic sacrifices. He also tells Jājali to give up his wanderings, to recognize that "the Soul is itself a Tīrtha (sacred place)." Tulādhara then looks up into the sky and tells Jājali that the birds that currently circle overhead are the very ones that he reared on his head far from this place. Jājali calls to them, and, at the close of the tale, the birds affirm Tulādhara’s teaching of nonviolence as the true path of liberation. 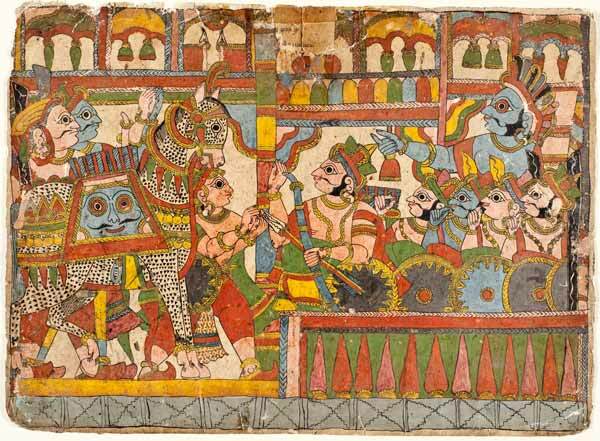 This story of Jājali and Tulādhara, because of Tulādhara's profession as a merchant in nonviolent goods and his description of the uniqueness of each living being, strikes one as theologically inspired by Jainism, which stems from India's early renouncer traditions. This is further supported by Tulādhara's critique of farming and his insistence that animal sacrifice must be abandoned. Though Dumont has posited that the practice of nonviolence and its attendant vegetarianism, was introduced into Hindu society from Buddhist and Jaina renouncers (Dumont: 149), this passage emphasizes the observance of nonviolence by laypersons, and highlights a key theme of the Mahābhārata: the integration of highest spiritual values into daily life. which of these is best for a person? All these in all ways are distinct doors of dharma. as the six are praised. the dharma that truly causes one to succeed. and has controlled lust and anger attains success. desiring the pleasure of the self, attains happiness. prospers happily in the life to come. who regards all beings as similar to oneself. The other stands in opposition due to desire. This is the essence of dharma. in the pleasant or the unpleasant, goes to samādhi. by this skill, all dharma is taught. This application of nonviolence, in addition to advocating abstention from hurting animals, emphasizes the adoption of a philosophical approach that sees all beings as not different from oneself, not unlike the Golden Rule’s suggestion to treat others as if they were you. This text proclaims that another person is similar to oneself, and must be treated accordingly. with the peerless authority of the Vedas. a man does violence, O Prince. How then does he free himself from sorrow? there are four specific nonviolence prescriptions. there is none, O Destroyer of Foes. is declared (inoperable) with three elements only. is proclaimed to be the highest dharma. (marked by violence), a living being can be tainted. do not ever taste meat. 10. Hear me, O King, as I tell the faults of such eating. though it is like the flesh of one's own son. from the union of a mother and father. Taste is born from the sensation of the tongue. (so as not to lead to) savoring (meat). then the mind becomes lost. the sound of the lyre's string? these praisers of meat manifest the fruits of faulty karma. have preserved the flesh of another with their own flesh. in accord with the purpose of all dharma. This has been said by you many times. one desires food offerings for the ancestors. dictate the use of meat. From where does this meat come? Is not something hurt? This is inconsistent. is found in abstaining from meat. What would be the fault of such eating? What would be the virtue of not eating it? or bought it in order to eat? with certainty I want to perform this eternal dharma. 6. How does one attain long life? How is one made strong? How does one attain faultless limbs? How is auspiciousness brought forth? O Chief of the Kurus. of what one is enjoined to do. self-disciplined men who desire such attainment. by the seers, O Chief of the Kurus. Listen to what has been taught by them, Yudhiṣṭhira. is equal to the one who shuns meat and honey, Yudhiṣṭhira. all praise abstention from eat, O King. is the friend of all living beings. such a one should be eternally esteemed by Sādhus. with the flesh of another falls into ruin. through austerity, giving, and sacrifice. is equal to the one who gives up meat and honey. always giving gifts, always sacrificing. is better than all knowledge and all sacrifice, O Bharata. 19. It is known indeed that to refuse meat is difficult. as the giver of life. all have fear of death. that even the wise desire existence. killing those that are healthy and free of fault. that brings heaven and happiness. by this, dharma is done. 26. Meat is not born of grass, wood, or rock. Meat arises from killing a living being. Thus, in the enjoyment of meat there is fault. oblations, sacrificial offerings, and nectar. unrighteous ways of flesh eating demons. or in the crossroads or in assemblies of people. there would be no killers. causing death for the purpose of food. there would be no violence. for the sake of the meat eater only. should refuse meat, O splendid one. are not able to go for protection (when they need it). The are to be feared by beings as beasts of prey. the opposite of dharma appeals to people. and is born here and there. and are bringing good fortune, renown, and long life. that person himself indeed kills. the three means of obtainment. has three means of destruction. is considered as having killed and is stained with fault. and attains long life and happiness. than gifts of gold, cattle, or land. Eating thus, a man goes to hell without doubt. will incur little fault is false indeed. a maker of great sin. The eater is not (as bad as) the killer. would indeed go to hell. having eaten llesh, holds back and abstains from this sin. any combination of these three are killers." established by the ancient seers in the beloved Vedas. does not have liberation as its purpose. any other meat should not be eaten at pleasure. men are not to eat such meat. they surely go to hell and infamy. should always shun the flesh of animals. by men's sacrifices of animals made of rice. 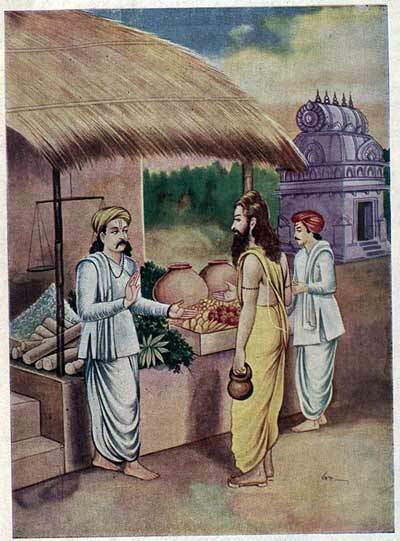 asked Vasu, the King of the Cedis (if he ate meat). But, O Lord, he did. from heaven to the ground. he entered the surface of the earth. by the appropriate attitude regarding the pleasures of meat. Not eating flesh always brings happiness, O Sovereign of Men. in my opinion are the same. one should shun all meat. Thus dharma is bestowed here. of fame, long life, mastery, and strength. he would live in great pleasure. the world of Brahman is revealed. which is the traditional aim of knowledge. and encircled with beautiful women. dwell in the highest region. are deemed bearers of dharma. There is no doubt they attain distinction among kin. 75. Such a man would not be born as an animal. O Best of Kurus, and would obtain great fame. regarding both action in the world and renunciation. As evident from the wide range of materials included in these chapters, Bhīṣma regards the practice of vegetarianism to be a longstanding component of Vedic religion. 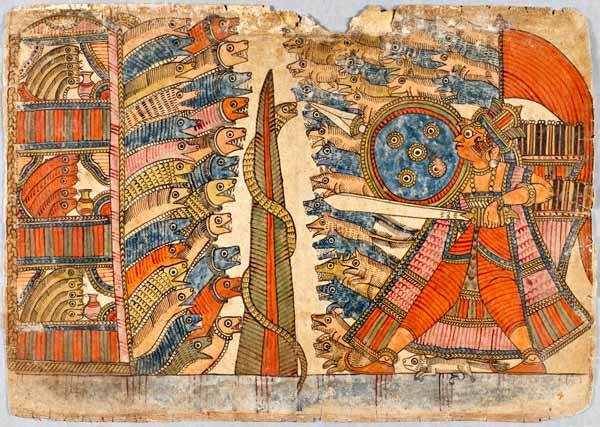 Not only are the names of the Seven Seers, Mārkaṇḍeya, Nārada, and others invoked in the name of forsaking flesh foods, Bhīṣma even contradicts the great lawgiver Manu. However, he does retain a degree of flexibilty, assenting to the notion that even relatively short periods of vegetarianism produce great merit. In conclusion, these three Mahābhārata texts on nonviolence perhaps indicate a Jaina influence, present a Vedāntic rationalization, and advance an enthusiastic embrace of vegetarianism within certain parameters. These passages indicate a respect for aspects of Jainism that accord well with the this-worldly message of the Bhagavad Gītā. Specifically, the story of Jājali and Tulādhara, advocates a strong yet spiritually disciplined laity. Within this cohort, renouncer values become integrated into everyday life as indicated by Tulādhara's insistence on nonviolence (ahiṁsā) and truthfulness (satya) in all aspects of his personal life and profession. Bṛhaspati advocates a philosophical re-configuring of nonviolence. Rather than rooting nonviolence in the pluralistic Jaina theology of countless souls, each of which must be respected in order for one to progress spiritually, he teaches a more mainstream Brahmanical interpretation of nonviolence based on the perceived oneness of all beings. This move perhaps indicates that in accepting the nonviolence ideal, some modifications in terms of justification were needed. And finally, in his admonishments to Yudhiṣṭhira that vegetarianism ought to be observed, Bhīṣma modifies certain requirements, allowing for varying degrees of stringency. Perhaps this indicates a certain political savvy on his part. By accommodating exceptions and limitations, the idea of giving up meat might be made more palatable to a member of the warrior caste. This also indicates the dynamism of the Hindu tradition, which has consistently exhibited a capacity to change and adapt to new cultural forms and the teachings of new gurus. In a certain sense, this modification of vegetarianism is not unlike compromises made in the development of early Christianity, such as when Paul proposed a new orthopractic code that deemphasized food laws and circumcision to encourage Gentile conversions. with orthopraxy are inherently inward-looking. 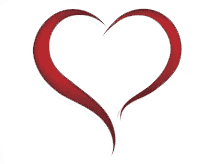 However, it is important not to divorce practices that cultivate spiritual grounding from a concern with societal issues. Though I know of no such formal studies, it might be the case that a land of observant vegetarians would be quite peaceful, as such persons would be not be likely to promote violent behavior. The Mahābhārata takes as one of its central themes the integration of highest dharma into the daily life of the layperson. This theme extends into the Vaiṣṇava tradition, which actively supports vegetarianism and the adoption of other nonviolent behaviors. The Mahābhārata provides textual sanction for the practice of nonviolence, rooted in the teaching that life is sacred in its distinct forms, and unified when seen as part of the spiritual essence that in Vedānta and Vaiṣṇavism is said to pervade all reality. Chapple, Christopher Key. Nonviolence to Animals, Earth, and Self in Asian Traditions. Albany, New York: State University of New York Press, 1993. Dumont, Louis. Homo Hierarchicus:The Caste System and Its Implications. Translated by Mark Sainsbury. Chicago: The University of Chicago Press, 1970. Ganguli, Kisari Mohan, translator. 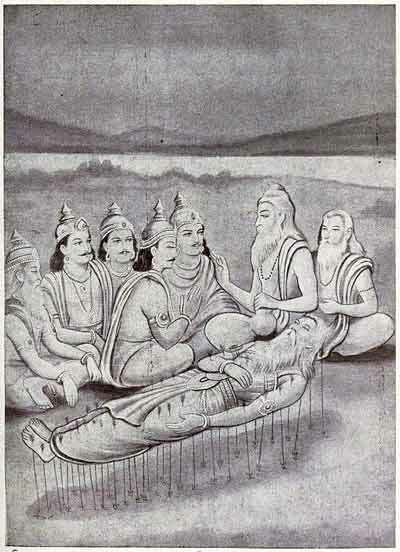 The Mahābhārata. Vol. IX. Sānti Parvan. Part II. New Delhi: Munshiram Manoharlal, 1970. Edited reprint of 1883-1896 translation. Mahābhārata . Edited by Vishnu S. Sukthankar et al. Fascicule 34. Poona: Bhandarkar Oriental Research Institute, 1963. Smith, Brian K. "Eaters, Food, and Social Hierarchy in Ancient India: A Dietary Guide to a Rev olution of Values.” Journal of the American Academy of Religion. Volume LVIII, Number 2, pp. 177-205. Zimmerman, Francis. 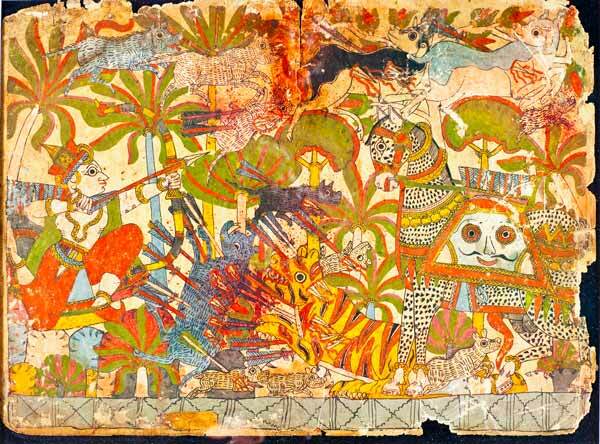 The Jungle and the Aroma of Meats: An Ecological Theme in Hindu Medicine. Berkeley: University of Califorma Press, 1987. First published in Journal of Vaisnava Studies, Vol. 4, No. 3, 1996.